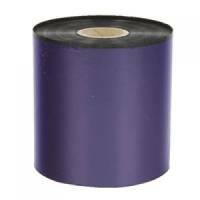 Brother Thermal Transfer Ribbon Ink Film Black PC71RF Pack of 1 PC-71RF Thermal Ribbon and Refill to fit T74/T76/T78/T84/T86/T94/T96/T98. Ref: 11307. Page yield 144. 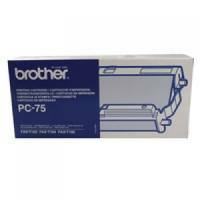 Brother Thermal Transfer Ink Ribbon (Pack of 2) PC72RF Pack of 1 Thermal ribbons for use with your fax machine. Provides prints that are clear and neat. Won't dry out, even with infrequent use. For us with the FAX-T72/T74/T76/T82/T84/T86/T92/T94/T96/T98. Each ribbon boasts a 144 page yield (per cartridge). Brother Thermal Transfer Ink Ribbon (Pack of 4) PC74RF Pack of 1 Thermal ribbons for use with your fax machine. Provides prints that are clear and neat. Won't dry out, even with infrequent use. For us with the FAX-T72/T74/T76/T82/T84/T86/T92/T94/T96/T98. Boasts a page yield of 144 (per ribbon). 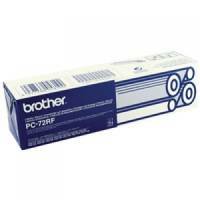 Brother Black Thermal Transfer Film Ribbon (Pack of 2) PC302RF Pack of 1 Replacement ribbon for Brother fax machines. Genuine Brother product for reliable performance. Print up to 470 A4 pages. Compatible with PC301 cartridges. Easy installation. Page yield of 470. 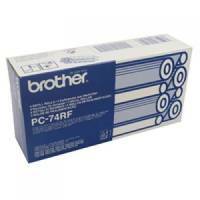 Brother Thermal Transfer Ribbon Ink Film Black PC75 Pack of 1 Replacement cartridge and ribbon for Brother fax machines. Genuine Brother product for reliable performance. Print up to 144 A4 pages. Cartridge compatible with PC71, PC72 and PC74 refill ribbons. Easy installation..
Panasonic Panafax KXFP181E/FP185E/FM189E/FP151E/FP155E Film 2x50m Pack of 1 Panasonic Black ink film KFXA55. 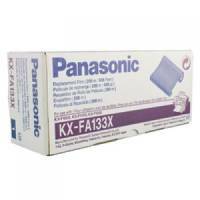 Panasonic Fax Film Ribbon KX-FA54X Pack of 1 KxfA54x ink film suitable for the panasonic kxfa 141 & 145. 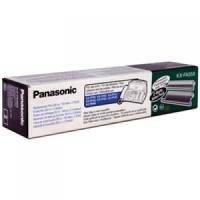 Panasonic Black Thermal Transfer Ribbon (Pack of 2) KX-FA52X Pack of 1 Replacement thermal transfer ribbon for Panasonic fax machines. 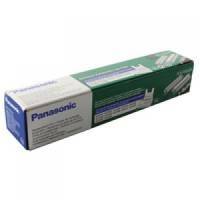 Genuine Panasonic product for reliable performance. Clean and efficient thermal transfer process. Safe to touch: will not rub off on your hands. Long lasting 30m roll. Twin pack. 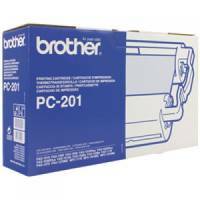 Brother Thermal Transfer Ribbon Cartridge PC201 Pack of 1 Brother PC201/9483 Thermal Ribbon Cartridge To Fit Fax1020, 1020E, 1030, 1030E and MFC1025. Page yield 420. 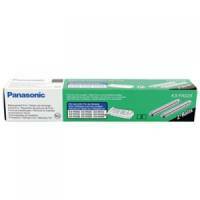 Panasonic Black Panafax Thermal Film Roll KX-FA133X Pack of 1 Thermal film for Panasonic fax machines. High quality film for crisp fax output. Designed for PanaFax KX-F1100E. Page Yield: 620. Lexmark IBM 4400 83mm TTW Thermal Ribbon 69G7319 Pack of 1 Replacement ink ribbon for IBM thermal printers. Genuine Lexmark product manufactured under license. Ribbon width: 83mm. Length: 625m. Colour: Black.. Brother Black Thermal Transfer Film Ribbon (Pack of 4) PC304RF Pack of 1 Replacement ribbon for Brother fax machines. Genuine Brother product for reliable performance. Print up to 940 A4 pages. Compatible with PC301 cartridges. Easy installation.. 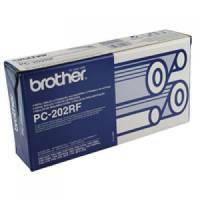 Brother Black Thermal Transfer Film Ribbon (Pack of 2) PC202RF Pack of 1 Replacement ribbon for Brother fax machines. Genuine Brother product for reliable performance. Print up to 840 A4 pages. Compatible with PC201 cartridges. Easy installation..